I don’t like Firefox. I think it is a monolithic, huge, heavy browser, and its XPI-based architecture feels slow and dated. That said, it is much more open and customizable than Google Chrome, and I do feel that using an “independent” browser is good for the Web. I say “independent” because Google are giving Mozilla buckets of cash for being the default search engine, but still, that’s relative independence. Yes – you’re reading that right. 977MB turned into 327MB, and that’s with the same exact set of eleven tabs open, and after I waited for all tabs to reload. So we’re talking about a reduction of 650MB of RAM, just by clicking one button and waiting about 15 seconds. That’s 5 seconds before I can continue working, and 15 seconds before all tabs load. 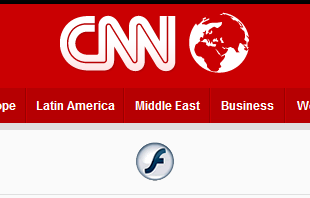 Why does that even happen – I have no idea, and I blame Firefox’s awful architecture and general portliness. But Memory Restart makes this problem much more manageable. You will have to find your own threshold by trial and error, but even if you have 16GB of RAM that doesn’t mean Firefox won’t become slow once it consumes more than a couple of gigs. 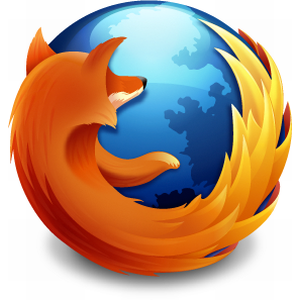 If you’ve ever been frustrated by Firefox’s slowness, this is the #1 add-on for you to try. Just click that once, and you’re done. Flashblock is smart enough to take embedded content into account: If you allow all Flash from YouTube, embedded YouTube video across the Web will start working. Indispensable, really. 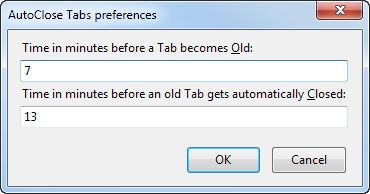 This last one is not a must-have, but it’s nice: AutoClose Tabs makes tabs grow “old” and then closes them after a while. Once a tab becomes old, its text color changes, so you can see it is up for closing. As you can see above, you get to configure the intervals. I experimented with 3 minutes and 7, but realized it’s too fast for me. 7 and 13 seems to be working well for my browsing habits. The add-on is smart enough to only count time while the browser is active, so if you have the browser showing a page off to one side, and you’re (say) writing a blog post in another window, the tab showing the page will not close (and nor will any other tabs on that window). The reason I say it’s not a must-have is that I did not notice massive memory savings due to closing tabs. If I close a whole bunch of tabs after Firefox reached 900MB of RAM, the RAM count doesn’t really go down. So you can think of it mostly as a way to unclutter your tab bar, and maybe it has a slight impact on speed as well. Firefox memory management is fundamentally broken, and I don’t know if it will ever be fixed (here’s hoping, anyway). Until then, these add-ons are good enough for me. Do you suffer similar problems? If so, what solutions did you find?